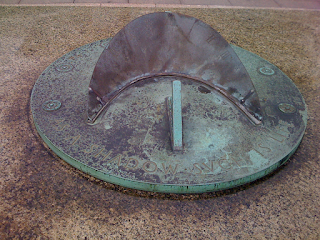 It was the best of times, it was the worst of times, ... it was the season of Light, it was the season of Darkness, it was the spring of hope, it was the winter of despair ... With apologies to Charles Dickens, I am writing about two sundials on Cornell's campus. One is outside Goldwin Smith Hall in the Arts Quad while the other is in the Engineering Quad. As an undergrad, I didn't pay much attention to either of these works of art. Apparently, neither do current students as they hurried past me while I was taking pictures. But these two sun dials merit contemplation. One is from the past, and with the gravitas that a layer of patina brings, provokes thoughts of time and mortality. The other looks outward, and with modern, shiny arms, seeks to embrace a future where the sky's the limit. When family and friends talk about college, and when college bound students ask me what they should study, I show them these two photos and ask them which one piques their curiosity. "Like many artists, I am very attached to my brushes. I love them all individually and I’m very familiar with their individual characteristics. I can distinguish between brushes of the same make, series and size. I know their degree of spring, their shape, their balance, and, most importantly of all, the marks I can make with each of them." This was the opening paragraph from an article on Artists and Illustrators. I'm no artist, but I felt an instant kinship. Developers -- the passionate ones -- care about their tools in the same way. I found C easy to pick up. Yet, it had the wonderful property in that the more you used the language, the more there was to learn. 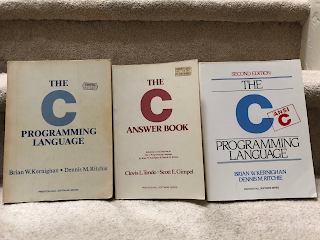 The book in the middle with the red title -- The C Answer Book -- provided solutions to the exercises presented in The C Programming Language (topmost book). It was neatly done, and kept pace with the concepts presented in the source material. Depending on how you learn, the answer book can be useful. Back in the day, before the internet matured, it certainly was. 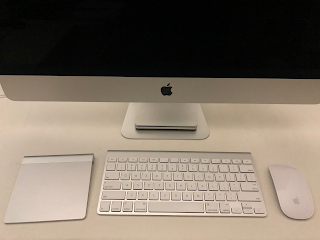 Today, it's not as essential because sample code abounds. The leftmost book was a first edition, and it beckoned me, sometime around 1984, from the shelves of Barnes & Nobles. Priced at $17.95, the book was a significant out-of-pocket expense for someone on their first job, but it would prove to be quite the investment. Turning to the Introduction, I noticed it was denoted as Chapter 0. This was a delightful self-reference to the C language itself, where arrays started with an index of 0, instead of 1. Think of it as an elevator that marks the ground floor as "G" and the next floor up as "1." 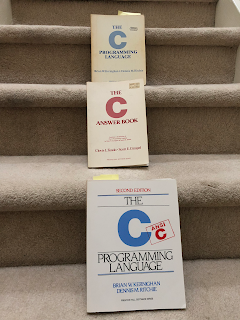 C's array and pointer capabilities were what made the language especially powerful, compact, clear, and efficient, but it also took discipline to use them right. Pointers let you access memory, but sloppy use can take your pointer to bad places, leading to security holes, and ultimately crashing your program. Channeling my inner mime, my profile photo shows me framed in front of Chateau Amboise, France.